Dr.Saquib Azad Siddiqui with his team. 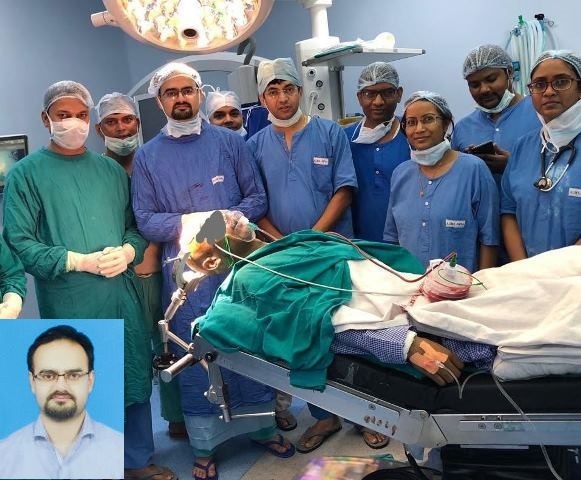 Patna: A path-breaking surgery was done by a team of doctors led by Dr. Saquib Azad Siddiqui, a neurosurgeon associated with AIIMS (Patna) who created a history in the state by performing Awake Craniotomy on his patient Rohit, a 21 years patient on Friday. “This operation is called Awake Craniotomy. During Awake Craniotomy the patient is awake and can communicate with doctors enabling them to remove tumor adequately without injuring normal areas of brain” told Dr Saqib to Muslim Mirror. Rohit was awake and communicating with doctors during the three-hour procedure. Giving the details about the operation, which was performed for the first time in Bihar Dr Saqib said “If the brain tumor is near the important brain center, then the operation is performed checking the function of the center and the tumor is removed safely. This functional evolution can’t be performed on unconscious patient. The 4cm tumor of this patient was near the center which controls right half of the body. We kept checking the movements of right leg and hand while removing the tumor. And finally we removed the tumor successfully after three hours. The patient Rohit is doing well and will be discharged after two days”. Previous articlePM Modi doesn’t need a degree, here is why!